Can we have an informed discussion about health care reform? One of the responsibilities that I enjoy a great deal and take most seriously as an educator is getting people to think about and to look at issues from all perspectives. Yes I do have my own opinions about many things, but I genuinely try to get people to form their own opinions based on an informed analysis of the facts. I am also willing to change my opinions when the facts no longer support them. In this vein, I find the national debate in the U.S. about health care reform very frustrating. While I admittedly support the Affordable Care Act (aka, Obamacare), I also know it is imperfect. If any health care policy wonk were designing health care reform from scratch, they would likely not come up with Obamacare. Yet I also recognize that health care reform is a political process, and that political outcomes, based on compromise and tradeoffs, never completely satisfy anyone. In addition, we cannot forget why we need health care reform in the first place, which is because our current health care system is wasteful, harmful, and not sustainable. Doing nothing is not an option, and I believe that Obamacare is preferable to maintaining the status quo. Probably the main reason why I find the health care reform debate so frustrating is that most Americans do not understand many of the core issues around health care delivery and finance. In particular, they do not understand the difference between health insurance and health care expenditures. Very few Americans, only the very wealthy, can afford to pay for all health care costs. Instead, we all pay for health care insurance. Furthermore, free markets do not really work in most areas of health care, and it is debatable whether we should even try to make them work, as I noted in this blog during the height of the debate over health care reform legislation. 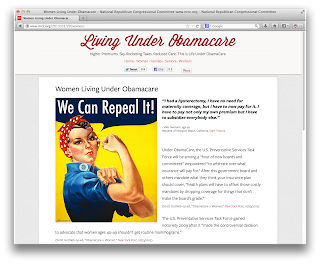 The person quoted on this site obviously misunderstands the concept of health insurance. How many people not needing a hysterectomy subsidized this woman's hysterectomy? She obviously does not understand that the whole idea behind insurance is that we "subsidize" each other's needed care, so that when we need it ourselves, it is available for us. If we start lopping off this condition or that procedure from health insurance, then we soon lose the whole concept of insurance. (This is one of the reasons why most Obamacare insurance exchange plans will be more expensive than cut-rate plans that offer meager coverage and can be terminated at any time.) Carrying this woman's logic to an extreme, does she now no longer support paying for women who need a hysterectomy, since she no longer needs one? Another manifestation of this thinking concerns Medicare. The famous quote "keep your government hands off my Medicare" (last couple paragraphs of this Washington Post article) best demonstrates how little many people truly understand about Medicare. Less blatantly, however, many elderly people who think nothing of demanding anything and everything from Medicare are the same people who are opposed to other forms of government-run health insurance, especially Medicaid for the poor. Yet these seniors do not realize that they are getting several-fold more benefits from Medicare than the contributions they have made over their lives (Fried, J (2008). Democrats and Republicans - Rhetoric and Reality: Comparing the Voters in Statistics and Anecdotes. New York, NY, Algora Publishing.). But I do agree with those who argue that we cannot provide unfettered access to any and all types of care to everyone, seniors or otherwise. We do need to make some decisions as a society about what constitutes adequate health care coverage, and who should pay what. There are some areas where competition and free markets work in health care, and those should be encouraged. But the notion that we can buy less costly insurance policies, covering only this or that, really does not make sense. I am willing to explore all the possible options for health care reform. Some conservative ideas make sense. But before we can have those discussions, a good proportion of the population needs to understand some basic realities about health care and its financing, and be willing to have an honest discussion about them.